Veterans know what it means to serve. We all stepped up, raised our right hands, took an oath and made the commitment. For those of us in the VFW, that commitment sent us in harm's way to a war in a faraway land. Our membership in the VFW is proof that we're proud of that service, that we enjoy the sense of satisfaction that comes from serving. Post 7728 fulfills its commitment to serve the youth in its community by chartering Boy Scout and Girl Scout units. As a chartering organization, Post members work closely with these units to help their youth programs thrive. Members who volunteer to support this vital program help the Post to fulfill its obligations to our youth. Some of the VFW's earliest ties to the community involve youth groups and perhaps none are stronger or more lasting than the relationship between the VFW and America's scouting organizations. In fact, VFW's partnership with the Boy Scouts of America dates back to 1915 when VFW Post 2100 helped to establish Troop 1 in Everett, Washington. Post 7728 has a Scout of the year program. The American flag may be flown at any time on any day, day or night. Dirty and tattered flags should be disposed of properly. Never dispose of them in the trash. Scouting units chartered by the VFW hold an annual celebration to retire old flags. A Flag Collection Bin is available at True Value, CK Home & Hardware (Bealeton Village Center) where you may take your old flags for retirement. See the US Flag Code for more information about displaying and retiring American flags. VFW Post 7728 can and has assisted in local Military Funerals. The post can contact the Military Honor Guard at Fort Pickett, Blackstone, Virginia. For information on how to secure these services, please call the post at (540) 439-1312. Please note that for final honors of departed Veterans, a DD214 is required. If you need assistance obtaining this documentation, please let us know. Every year just before Memorial Day members of Post 7728 place flags at the graves of veterans at seven local cemeteries. 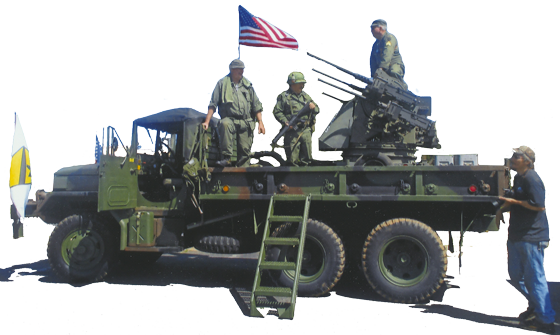 Post 7728 maintains the use of several historic military vehicles which may be used for static display or participate in parades. Contact the post for details.